Have you applied to the Yale School of Management or are you planning to apply? You may be wondering about that something extra in your Yale SOM application checklist—the Behavioral Assessment. The admissions team implemented this new, innovative tool to help them bring together a strong MBA class. 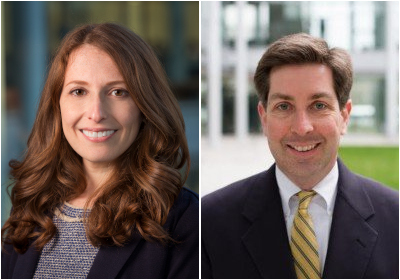 To get the skinny on what the Behavioral Assessment is and how it’s being used in the Yale SOM admissions process, we caught up with Laurel Grodman, managing director of admissions, analytics and evaluation, and Bruce DelMonico, assistant dean for admissions. Read on for in-depth insights from Laurel and Bruce regarding how this tool plays a part in your MBA admissions experience. Could you start by explaining what the Behavioral Assessment is and how it now fits into the Yale School of Management MBA admissions process? The Behavioral Assessment is an online admissions tool that measures a set of interpersonal and intrapersonal competencies associated with business school success. It’s administered by the research division of ETS, and takes about 20 to 25 minutes for an applicant to complete. The test itself is a forced-choice module, in which you are given 120 pairs of statements and you have to choose the statement that is more like your own behavior. You don’t need to do anything in advance to prepare for the assessment, nor does it require any specialized knowledge or information. How was this introduced into the admissions process? In other words, where/how did the idea start? How was the assessment itself developed and implemented? Our team has always been deeply committed to exploring innovative ways of evaluating candidates for admission, especially ones that allow us to look beyond traditional metrics like testing and academic performance. In particular, our interest in finding a non-cognitive assessment to supplement the existing tools within the admissions process goes quite a way back. While admissions factors like test scores and academics are useful predictors of business school performance, they can’t tell us everything we need to know about a candidate. The idea for using this particular assessment in the admissions process started several years ago, when it was administered to Yale SOM students as part of their leadership development training. The professor who led leadership training at the time was also involved in the assessment’s initial development by the US military. When the assessment was purchased by ETS, he was open to our request to include it as one of the student inventories in the first-year core, which allowed us to gain insights into its predictive validity. Having robust testing data from actual Yale SOM students gave us the ability to look at how the assessment results, in combination with other elements of the admissions process, factor into school performance outcomes. The Behavioral Assessment was particularly appealing as an admissions tool because it looks at specific non-cognitive abilities that we know matter to us. In particular, we’re interested in evaluating secondary and tertiary traits that might help us identify high-potential candidates whose testing and academic performance may not otherwise suggest that they will perform well in the program. And unlike an essay or an interview question, which is open to individual interpretation and bias, it provides the committee with a result that is fair, consistent, and measurable. From the initial study onwards, we’ve been working with ETS both to evaluate and implement the Behavioral Assessment for use in our admissions process, and we’re the first and only school to explore this novel approach to evaluating candidates. We piloted the assessment in the admissions context in the 2017-2018 application cycle—in order to collect more data and to ensure it was functionally integrated within our application process—but we didn’t use it evaluatively last year. This year, we’ve included the Behavioral Assessment as part of our standard admissions process, and all candidates invited to interview have taken the assessment. Next year, we plan to roll it out to all applicants. What was your goal in introducing this assessment? Ultimately, we want to bring into the program a diverse group of students with wide-ranging interests and backgrounds, who are going to thrive during their time at Yale SOM and beyond. In admissions, we have a relatively limited set of information with which to predict student success. Standardized tests or assessments are appealing, because they eliminate some of the biases that can creep into less structured parts of the evaluation process. But cognitive assessments like the GMAT or GRE don’t tell us everything. So our goal is to use this non-cognitive assessment to better evaluate candidates who don’t perform as well on traditional academic measures, but who still have the ability to thrive in our program. On the other side, it can help us better evaluate candidates who do well on tests but end up underperforming in school. At this point in time, we’re using it specifically to predict classroom performance. In the future, as we continue to collect more data, we hope to use it to help us select for positive non-academic outcomes as well. You noted in this article by ETS that diversity and inclusion were at the forefront of your thinking in regards to implementing this tool. How do you anticipate that the tool will aid in this mission? To truly fulfill Yale SOM’s mission of educating leaders for business and society, you need a community of students whose backgrounds, experiences, and interests are diverse and expansive. If we limit ourselves to applicants who perform best on traditional academic measures like GMAT, GRE, or undergraduate GPA, we may miss out on candidates with extraordinary professional experience or personal backgrounds that would add vital perspectives to the classroom. At the same time, it’s our responsibility to ensure we bring students into the program who will succeed in the classroom—we don’t want to set up students for failure. The Behavioral Assessment gives us an additional piece of information in assessing who will perform effectively in the curriculum, specifically by helping us predict who will perform better than the academic history would suggest. So, it will allow us to take more chances on candidates without the strongest academic or testing profiles, but who nonetheless have what it takes to succeed in the classroom and who undoubtedly will make significant contributions to our community in terms of their experience and perspective. How much weight does the Behavioral Assessment carry in evaluating candidates? Is it more or less or the same as traditional application elements, e.g. GMAT/GRE, recommendations, résumé, essay, etc.? Right now, we’re using the Behavioral Assessment with a light touch within the overall application process. And we’re using it very specifically as a data point within our assessment of academic potential (in the future, we hope to use it to better predict non-academic measures of success as well). The assessment alone will not be the deciding factor for admission, but it can prove useful when considered in combination with other elements of the application, like academic history and test scores. The more student data we can collect and analyze over time, the more expansive we can be in our use of the assessment within the admissions process. What will “success” look like and how will you measure it? Can we decrease the number of students who face academic challenges in the program? In particular, can we better predict which high-test-score students will underperform in the program, and which low-test-score students will over perform, based on their non-cognitive traits? Can we better differentiate among those in the middle? By decreasing our reliance on traditional metrics, does the assessment allow us to bring in a class that is even more diverse in their backgrounds and experiences? Can we expand the use of the assessment to predict not only classroom success, but also other non-academic factors that are important to being a good member of our business school and alumni community? Can we connect the Behavioral Assessment to the Yale SOM student experience? On this last point, we know that applying to business school is a significant undertaking for our students, and hopefully one of deep reflection and discovery. Ideally, you should know more about yourself coming out of the process than you did going into it. We’d love to get to the point where taking the Behavioral Assessment as an applicant is the start of one’s ongoing leadership development as a student, and when you arrive at Yale SOM, you’ll have an opportunity to learn more about yourself by receiving your assessment results in a structured classroom setting. We’re not there yet, but we’re starting conversations with ETS and with faculty, with the goal of making that happen. How has it been received and what results have you seen thus far? So far, the candidates seem to be responding well to the test. We surveyed the students who took the assessment as part of the pilot last year, and the overwhelming majority were either positive or at least neutral on the experience. Most of the feedback we received was around wanting more information on how the assessment will be used in the admissions process, and we’ve included more of that context this year. While this kind of tool is totally unique within the sphere of business school admissions, many employers have introduced non-cognitive assessments as part of the job application process or as professional development tools. Given this context, we suspect this generation of business school applicants is more acquainted with and open to this type of assessment as part of the application experience. Also, lots of students were curious about their results—as mentioned, our goal is to get to the point where we can share results with incoming students as part of their classroom experience and ongoing leadership development. As far as results go, it’s really too early to comment since we are still in the midst of the first application cycle where we are using the assessment within our evaluation process. Our goal is to gain more and more confidence with how we can use the assessment, but it takes a fair bit of patience—with every cohort that takes the test, we need to wait a year after they matriculate to really begin evaluating academic results, and even longer to start assessing other types of business school and post-business school outcomes. So, the data collection and analysis is an ongoing effort, but at this stage, we’ve begun to use the assessment within our evaluation process, albeit with a light touch, and it’s allowed us to make some calls that we otherwise might have been more hesitant to make. What would you like Yale SOM MBA candidates to know about the Behavioral Assessment? When it comes to taking the assessment, don’t overthink it. In some cases, it will feel difficult to choose the statement that is “most like you” from the two options; you may feel as though neither describes you accurately, which is particularly difficult when both choices seem like negative traits or behaviors. One of the great things about the assessment is that no single response is going to be determinative of the results. The test is adaptive (no two test-takers will get the exact same set of questions) and it’s looking for patterns in your responses. So don’t stress over how you answer any one question. On that note, there’s really no need to stress over the assessment more generally. There are truly no “correct” answers, and unlike many other aspects of the application, there’s no preparation needed – we hope applicants find that liberating! We also hope they’ll appreciate that unlike some of the more subjective elements of the admissions process, the assessment measures all applicants in the same fair, consistent way. It has nothing to do with how much someone does or doesn’t connect with an essay topic or a particular interviewer (though we do lots of work to reduce this type of bias in our process as well). It has the potential to be quite a powerful tool in helping us take chances on candidates who don’t look as strong on traditional cognitive measures. We think that’s something that should be quite exciting to our applicants.